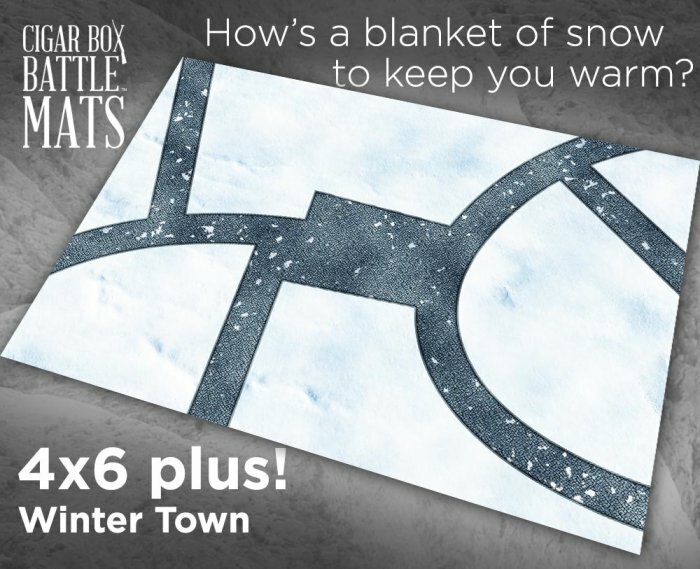 The Winter Town mat (#380) works perfect for Frostgrave, or it will transport you back in time and allow you fight out battles from the middle-ages, all the way up to WW2 and beyond. Just add your own period buildings, figures and other terrain features and you will be ready to roll dice in minutes! This mat is professionally illustrated and perfect for your troops to fight over for control of the city! It has great detail to really help bring your game alive. We use this mat for 28mm Frostgrave, 28mm War of the Roses, 28mm Napoleonic's, 28mm and 54mm World War Two and modern Zombies! What would you use it for? It's great for Fantasy RPG's too! • We recommend this mat for 20mm - 28mm scale figures.